Lentils are really a super food. You can do so much with them. 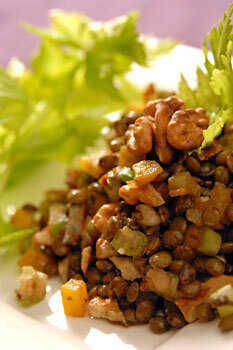 Here we have brown lentils featured in a salad. It’s nice and crunchy with the celery and walnut pieces, and tastes even better on the 2nd day. Cook the lentils with some salt, cumin and a bay leaf. Cook until tender but not too soft about 7 min. depending on what sort of lentils they are. Drain and cool (discard the bay leaf ). In a small bowl combine the rest of the ingredients and add to the lentils. Prepare the dressing and pour over the lentils. 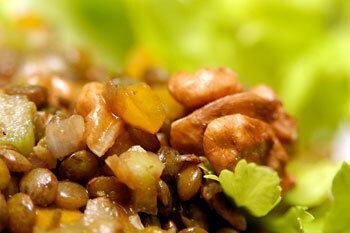 Posted by Chris Walker on April 25, 2007 in Celery, Ingredients, Lentils, Meals, Salads, Walnut.